Accompanied by Dr. André Weinreich, Head of Research & Science from emolyzr/Humboldt University, I’ve run several sessions during the winter semester 2016/17. We had up to two groups each week – one at the University Ostwestfalen-Lippe in Lemgo, the second at Humboldt University, Berlin. André Weinreich is a psychologist and researcher of emotions. He instantly understood what I am after, to examine the recorded heart rate of movie goers and he urged me to collect data on a broad variation of movie genres. We have two more movies left, but I’d like to compile the list of the recent movies. The data is about to be analyzed – which will keep us busy the next months. We probably release some insights from time to time, but please be patient for the proven outcome. 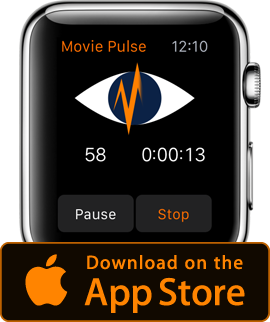 Nevertheless I am still working on Movie Pulse as a tool useful for movie maniacs. I have a certain feature in mind for the next major release, but you’re always welcome to send ideas, feature requests and of course report malfunctions. This story is based on a novel which is freely inspired by historical events. I know this is the most controversy movie I show in my lessons, because students of several years told me. It has been chosen because it evokes disgust as well as sexual stimulation (among other other things, of course). A drama with the focus on the relationship of a doctor and one of his patients, based on real events. This has been the movie I cried the most in my whole life. It has been chosen because of it’s emotional power to evoke compassion as well as it comes with a particular humor. A caretaker is threatened by the household. Although a bit outdated in terms of it’s fantastic and dystopian filmic universe, the movie is a classic and has been a boiler plate for a series of these kind of movies. It’s part of the screening because of a provocative story, an imminent bad ending and hilarious comedy. A mainstream movie, based on the Marvel comic universe with a favorable actor. Part of the list because of the absence of real human being living condition to identify with, as well as the presence of FX in visual and audio terms. Based on the life of two real brothers, this movie brings two important things: an impressive performance of a famous actor (playing adult twins) along with an incredible story. Chosen because of it’s intensity of character presence, conflict and brutality. An intellectual movie facing a near future we might have with our smart devices. The movie develops an relationship between the main character and a machine. The scale of emotional involvement of the audience in this artificial plot setup makes this movie interesting for the list. A movie based on the proven success of an existing phantasmagorial filmic universe. It deals with conflicts of characters of a non-contemporary plot, fantastic creatures and audio-visual impression. It has been chosen because of the probably lesser character identification, but larger impact in visual and sound terms. Based on a major conflict a couple has to deal with, the story heads towards classic changes in character judgement by the audience. This movie delivers a focus on the compassion the audience might have with the male or female – without being distracted by visual effects. The dystopian Science Fiction settled on Earth in some near future re-interprets the successful original from 1987. The movie contains threatening cutting edge technology as well as the misfortune of a human being. Both made this movie useful for the list: the massive audiovisual impact of FX and the sympathy with the main character. Based on another Marvel comic character, this movie provides a cynical, obscene and hilarious hero and a classic hero arc. This movie has been chosen because of it’s classical plot, hilarious comedy elements as well as it’s controversial character. A female misfit character reclaims her acceptance within her adolescence development. A movie dealing with down-to-earth real problems of a young woman in a contemporary time frame and a ordinary setting. The absence of larger than life plot construction (and production scale) makes this movie of use for the list. How will this affect the compassion ability of the audience? A weak character by definition (bunny) in a classical zero to hero (animation) movie. How will the animated characters move the emotions of the audience? Will the movie provide an immersive experience similar to non-animated movies? These are some main questions we might have analyzing it. Preceding events of the life of the main character are affecting the love to a woman. The movie comes with a realistic setting along with a kind of psychedelic split-person threat. How does the audience deals with the psychic harassment as well as with the imminence through physical brutality will make this movie of use for us. Besides it’s humorous handling of (German) nationalism, the movie has an intellectual quality while offering jokes on all kind of institutions, social levels as well as media formats. The questions for the study can contain the following: How does the controversial topic, the hilarious exposure of quite all characters and the quick succession of jokes will affect the audience? A unpredictable character intrudes the life of a single mother with light force. A drama as well as a love story does the movie provide a strong quality of sympathy for all three main characters: intruder, mother and son. Besides the grade of identification with the personell will (presumably) the predictable and imminent end provide strong emotional response of the audience. This science fiction with a fundamental optimistic belief in human expansion (technological and spacial) is an intimate theater on a space ship of sheer enormity. The lack of an alien threat helps to focus on the existential situation (mainly) two people are in. Therefore we can exploit how the audience involves with the development of the couple and how the the imminence both have to deal with affects visually and especially at the sound design. We probably won’t be able to include the following movies, because of poor attendance and we had an essential change in questionnaire structure. We might be able to run additional sessions to increase the required number of test persons; the sessions are not necessarily bound to take place at the same location/at the same time. But, the lack of questionnaire quality does not recommend it.